Sabudana khichdi is popular and native to the Indian states of Maharashtra and northern Karnataka, especially those parts of Karnataka bordering Maharashtra. Also consumed in Gujarat and other parts of India, Sabudana khichdi is a popular breakfast and snack item and a regular part of the menu during fasting days for the Hindus of the region. I have always loved Sabudana khichdi since childhood. What I relish the most about this khichdi is that the sago pearls almost melt in the mouth. 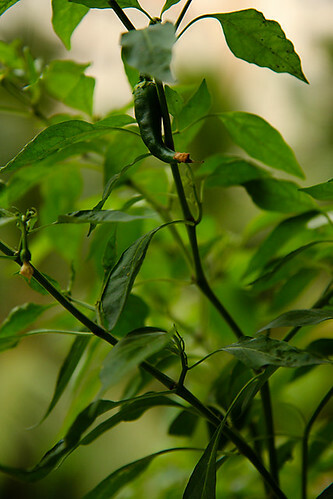 When mixed with plain yogurt or curd, the cooling attributes of the yogurt act as a perfect balance to the heat of the chillies. My grandmother or ajji as we grandchildren lovingly call our maternal grandmother makes this with a special touch. Nobody would dispute the fact that grandmothers have a magical hand. Whatever is cooked by both my grandmothers holds a special place in my heart, both of them being cooks par excellence. Many a time, sago and tapioca are confused for one another because of their identical looks although both are derived from different sources. Sago is processed from the sago palm and tapioca is derived from the tubers of the cassava plant. 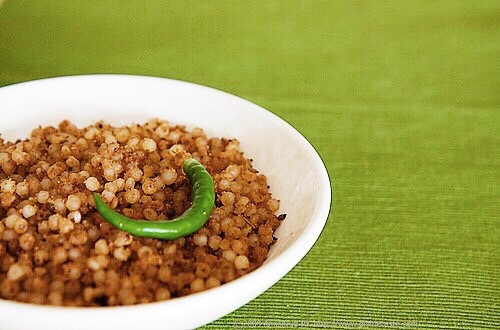 It is important to use sago for this khichdi, as tapioca tends to get stickier. Obtaining sago pearls, which are soft, separate and fluffy is quite a challenge to many. Having faced this challenge myself, I know exactly what it means when someone says making sabudana khichdi is a messy affair! The trick to getting it right is in the method of soaking. Everyone seems to have a different method for soaking sabudana, so there is no one correct, foolproof method as such. After a lot of trial and error I follow Method 1 given below and this is the one that I’m most comfortable with. My mother and mother-in-law both follow different methods and their khichdi turns out well too. The colour and the flavour of the khichdi are dependent to a large extent on the degree to which the peanuts have been roasted. I like to roast the peanuts to a nice brown colour, which I find lends a nutty, delicate aroma and flavour to the khichdi. Sabudana Khichdi can be served as a breakfast or snack dish. Most recipes use grated fresh coconut and coriander as garnishes, but my recipe doesn’t include both. To make potato khichdi, add 2 boiled potatoes in the seasoning. We relish this khichdi with plain curd/yogurt and a green chilli on the side. Bring 1.5 litres or 6 cups water to a boil. Switch off the flame and soak the sago in the hot water for exactly 5 minutes. Drain the water in a colander and wash in a stream of cold water. Drain thoroughly. Add ½ cup water, cover and leave overnight or at least for 5 to 6 hrs. The sago soaks up the water. In the morning wash once again, drain and leave to dry in a colander for any time between 1/2 hr to 2 hrs. If you find the above method too tedious, you could try doing what the ladies in my family do. Place the sago in a colander and wash briskly in running cold water. Drain and leave covered overnight or for at least 4 to 5 hours with ½ a cup of water. If the sago is not soft, wash once again, drain and allow to dry a bit. Another easy method is to soak the sago with water and leave it aside for about 30 minutes. The sago soaks up the water. Drain completely after 30 minutes and keep it aside overnight or for 6 to 8 hrs. Heat the ghee or oil in a wok over a medium flame. Lower the flame and add in the cumin seeds, green chillies and curry leaves. Stir in the potatoes at this stage if using them. Mix in the sago and stir carefully until the seasoning is properly mixed with the sago. Put in the cumin seed powder, the roasted and powdered peanuts and mix carefully, since sago is quite fragile and can get crushed easily. Cover and cook on a low flame, stirring occasionally until the pearls turn translucent. Make sure that the sago pearls don’t get lumpy or stick to the bottom of the pan. This should take about 8 to 10 minutes. Add the salt and lemon juice and mix properly. Garnish with the optional grated coconut and chopped coriander. Serve hot. * Grind 1 cup whole roasted unsalted peanuts without skin in a food processor. Work in short pulses and give the peanuts a few seconds to cool between each pulse or else you’ll end up with a sticky mass. Update: Due to time constraints and hectic schedules, I'm now following the second method of soaking sago with great results! 1. Add 2 medium sized potatoes boiled and cubed (optional) into the seasoning for a variation. 2. The cumin seed powder adds a lot of flavour to this dish so do not skip it. 3. You can reduce the peanut powder by half the quantity if you wish. After a few trials, you can figure out how much peanut powder suits your taste. Our Ekadashi snack. I love it. This was one of my favourite discoveries from Hubli! Love it! 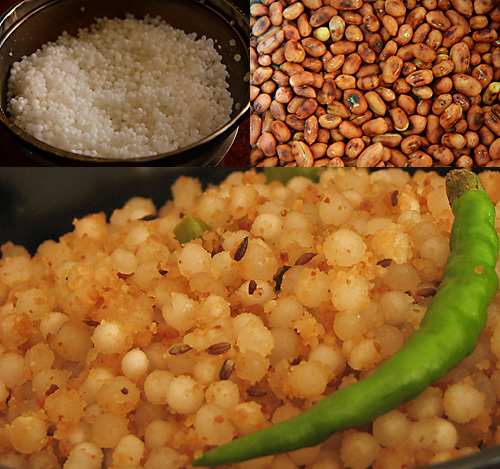 Preethi: My grandmother mixes the roasted peanuts with the soaked sago before adding it into the seasoning. I generally do it after adding the sago into the seasoning. I have added it in the recipe Preethi. Don't know how I missed it. Maybe because I posted it late in the night and you know my present condition. 😉 Thanks for pointing it out. I've never made kichidi with sago. Would love to try it one of these days. I never make this myself. My friend's grandmom would make delicious sabudana khchidi with peanuts. i would wait when I would go to her house & eat some. Very nice clicks. Sabudana khichdi is one of my favorites! Anu..i couldnt stop myself from telling you that i think the brown colour of it in the white dish and especially the green chilly would stand out perfectly against a lemon yellow background.. just a thought… otherwise beautiful photography!! absolutely love it..good going..
Soumya: I'm sure a lemon yellow background and colour would look just great. You cant go wrong girl with your great sense of aesthetics in art. I love this with cold yogurt and with a little bit of sugar sprinkled on top….what a treat indeed. My sabudana always turns out to be slimy I cannot understand what I am doing wrong. I love it with cold yoghurt too. Might try your soaking method. Thanks for visiting my site and leaving a comment. I am quite disappointed to tell you that my sabudana kichdi came out to a gooey thing after following your method 1 instructions to word by word. My sabudana just dissolved and I couldn't even find a single pearl in my kichdi. Just a quick suggestion for newbie's following your receipe,please mention that sago has to be extremely dry in the colander before adding it to the seasoning.Anyways I will give it a try with your method 2 and 3. Thanks! Kanthi: I agree that getting distinct sago pearls separate from each other is quite tricky. I have mentioned in the recipe (method 1) that the sago pearls should be left to dry in a colander for 1/2 hr. When it is left to dry for half hour, the pearls soak up all the water. This is the method I use the most with perfect results and it has never failed me. Getting good results is also largely dependent on the quality of sago pearls. Hello! I came across this recipe while searching for perfected sabudana soaking techniques, and I must thank you for helping me to finally make khichdi with great success! I have tasted and loved it in India, and tried–but failed–to make it at home in the past for my boyfriend (he's Indian, I am not, but I reign over the kitchen). But this time around I used method one (refrigerating it overnight) and it came out perfect. All the grains stayed separate, soft, and fluffy. The only thing different that I did in preparation was to toss the sabudana, peanuts, salt, sugar, and a squeeze of lime together before adding to the pan (a tip I read in Ruchira). Thanks again for such a helpful post and recipe. Amanda: How nice to hear that! Yes..my grandmother does it that way that is she mixes the peanuts with the sabudana before tossing it into the the oil. But, I prefer this method. Anyway, great to hear that this was a success with you! We add a little of ginger paste n even tomatoes tht makes it tastier….howevr my husband likes it simple like this….